The Procter & Gamble Company Pfizer Inc. The use of a proxy summary section in Proxy Statements has grown dramatically over the last few years. As a market indicator, EZOnlineDocuments annually reviews the S&P 500 companies to study the trends in online Proxy Statements and Annual Reports. Over the last few years, we've seen a leap in the use of a proxy summary, from 49% in 2015 to 67% in 2017. What goes into a proxy summary? Proxy summaries are an exceptionally useful way to present key information that you want to stand out from your lengthy and complex Proxy Statement. The average number of pages in our sample of proxy summaries is five, while the largest is eleven. Most of the proxy summaries have a section that lists the voting maters and the company’s recommendation for the vote. A list of director nominees is also a key section of most proxy summaries. 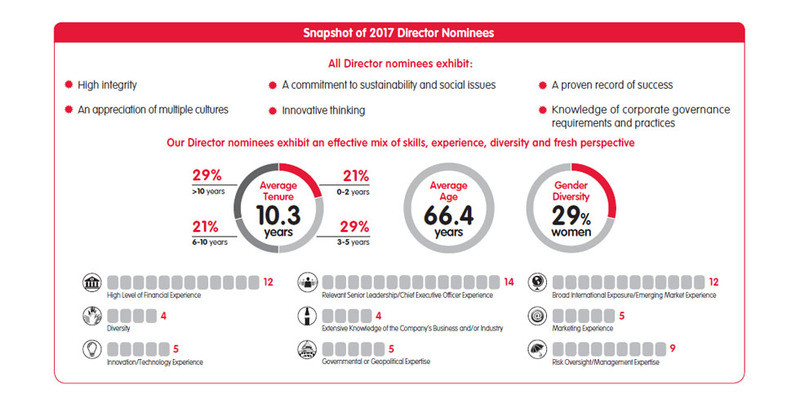 The lists usually include traits such as age, director since, diversity, independence, primary occupation, committees, and involvement in other boards. Most proxy summaries in our sample have a section—often lengthy—covering executive compensation. Other sections, such as a discussion on the link between pay and performance, compensation program enhancements, and key features of the executive compensation program, are also often included. 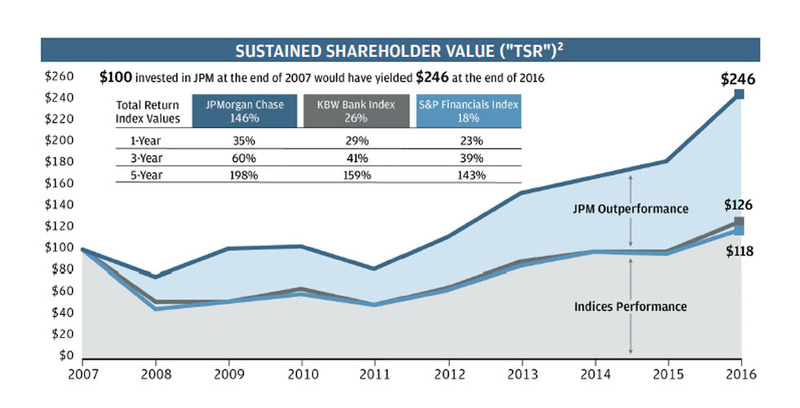 Most proxy summaries in our sample highlight their corporate governance practices. Just over half of the proxy summaries in our sample showcase their performance in sections such as Operational Performance, Business Performance, Financial Review, or other similar sections. 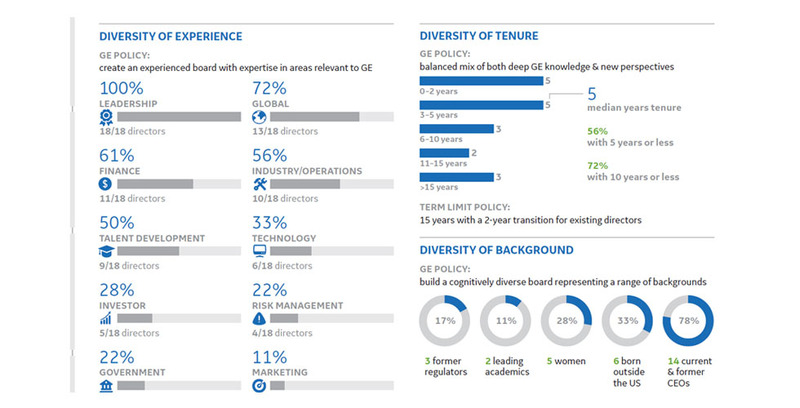 Half of the proxy summaries in our sample showcase the composition of the board on various measures such as diversity, tenure, age, experience, and many other traits and skills. This section often includes charts and diagrams for impact (see our slideshow below). Half of the sample Proxy Statements put the meeting date and notice or a how to cast a vote section in the summary instead of on its own page. 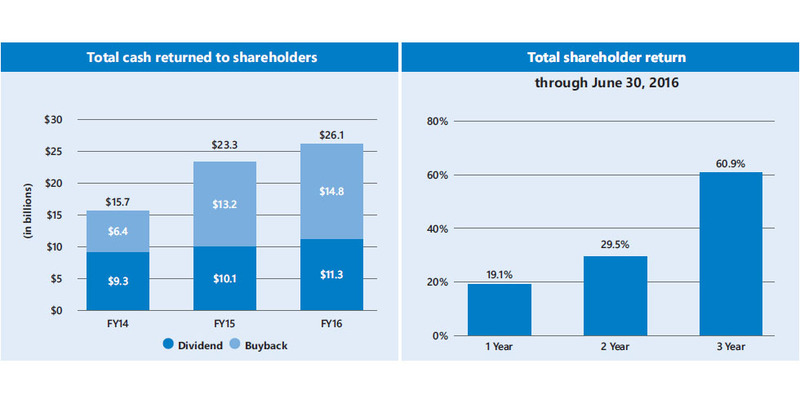 Some proxy summaries include a section showcasing their return to shareholders. Some proxy summaries include a company overview or list of values, using the summary as an opportunity to discuss overall company objectives. Of the twenty companies in this review, 25% presented the online version of their Proxy Statement in an Interactive format instead of PDF. The Interactive format is a key method of upgrading the experience for online investors, who choose Interactive over PDF 96% of the time. Adding or enhancing a proxy summary is a high-value way to improve shareholder communications. After you’ve added the proxy summary sections that best fit your company, converting the PDF into an Interactive format is a last step in making your online proxy summary the most easily understood and visually appealing version for investors. Our next article, "State of the art presentation of Proxy nominees," discusses visually enhancing your board nominee information, which is another key upgrade we have seen appearing in Proxy Statements over the last few years.